Do you have the next Mozart or perhaps Liberace tinkling the ivories? Maybe singing is more their thing? If so, read on to find out more about the early years musical experiences on offer in K & M.
Tooters have been delivering unique and exciting music sessions to children aged between 0 and 7 years across the North East of Scotland since 1999. The weekly music sessions for parent/carer and child provide an early years’ music programme that reflects current educational developments but also draws on approaches to music education that have been used for many years. All Tooters’ activities are devised to appeal to the child of today, but have an underlying musical and developmental objective. However, at the heart of the Tooters’ ethos is enjoyment, with the emphasis on having fun in a warm and welcoming environment. 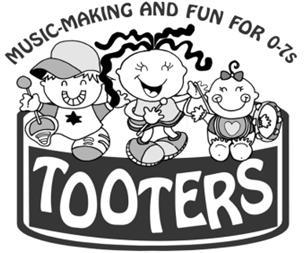 The original Tooters concept was devised by music teacher Pamela Hossick. Over the years the programme has been revised and amended by Pamela and co-Tooters tutor, Innes Hearns, to ensure a fresh and exciting approach to early music education. The programme takes into account current developments in music education and complements the work that goes on in schools, nurseries and other early years’ settings. Both Pamela and Innes are experienced music teachers specialising in early years’ music and have a wealth of knowledge and experience in how to engage and inspire youngsters through music. Pamela also calls upon her experience as an infant teacher to ensure that Tooters’ classes include activities that enhance early literacy and numeracy. Each active Tooters, Tooter Tots and Toots session introduces the children to the core musical concepts of beat, rhythm and pitch. The children experience these concepts through a carefully selected programme of games, songs and activities which also encourage sharing, taking turns and following simple instructions. Activities change weekly but the class routine remains the same. Special Tooters songs structure the sessions giving an organised and purposeful atmosphere to the classes. The Tooters programme continues into primary school with Toots providing music classes for P1/2 children who are still a little young for one- to-one music lessons. Both Pamela & Innes teach piano and strings at Musiczone in Stonehaven and at the most recent pupil concert at least 75% of the pupils who performed had attended Tooters as a young child. The Tooters’ programme succeeds in its aim to build musicianship from an early age. We hope to instil a life-long love of music and take pride in laying musical foundations in all our little Tooters! There are 3 age groups in the Tooters, programme – Tooter Tots (0-2), Tooters (2-4) and Toots (5-7). As far as possible we try to keep children of a similar age in the same class, and each tutor is skilled in delivering appropriate material that centres round the individual children in each class. TOOTER TOTS: Activities include simple action songs and finger play, exploration of age-appropriate percussion instruments, listening to music and games with puppets & props. TOOTERS: Activities include action songs with puppets & props, listening/ singing games, exploring music with the parachute, games to develop the use of percussion instruments, & responding to music. TOOTS: Activities include songs and games to develop the basic musical concepts beat, rhythm and pitch, and through work on percussion instruments and descant recorder, the children are gradually introduced to music notation. For more information on Tooters contact Pamela Hossick on 01561 361645, find us on Face book or click here to learn more. This entry was posted in Local Blog and tagged children, education, Music, Newtonhill, Portlethen, Stonehaven.